I have been a fan of the book for years and even have attendings asking to borrow it. Finally downloaded the app and couldn’t be happier! It’s so much faster to find the related topic than flipping through a book and the displays are slick. In the app form, the updates are now more frequent instead of waiting for a reprint of the book. I encourage everyone to switch. Outstanding product with plenty of pearls we can use on-shift! Love that the new app rapidly incorporates evidence-based updates rather than having to wait for an entirely new version! I wanted to use it on iPad pro with keyboard. App does not work when iPad is in landscape orientation; it stays locked in default and everything is sideways. When i try to zoom in on the antibiogram on iPad or on iPhone, it only makes the freaking header text larger. What the heck?! Useless. I do not like how I can’t look up by disease. Disappointing update. Please, re-integrate bookmarks. It was a fav feature for me! I paid for the 2018 edition but am using the 2017 version because it’s faster as it opens to my bookmarked page! Kind of feel dumb for paying for the newest edition. Huge fan of the series...so far this update misses the mark. 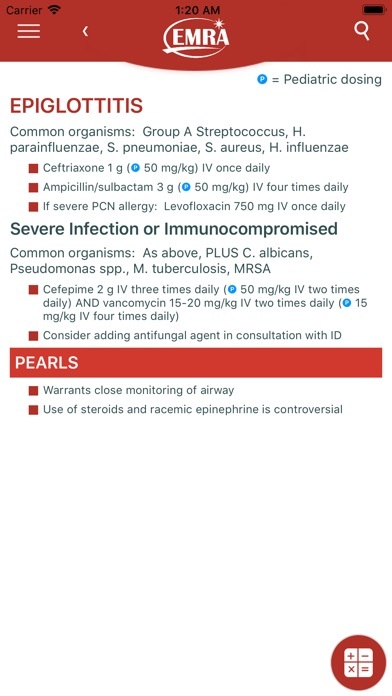 I’ve been a fan of the EMRA Antibiotic Guide for many iterations and was thrilled when they released an app. I use my app almost every shift, and was actually happy to see a subscription based product with continuous updates this year. Despite this being the natural genesis of the app, the app design itself is a big step back from 2 years ago and does not warrant the slight increase in annual cost ($16.99 every 2 years vs $9.99 every 1). 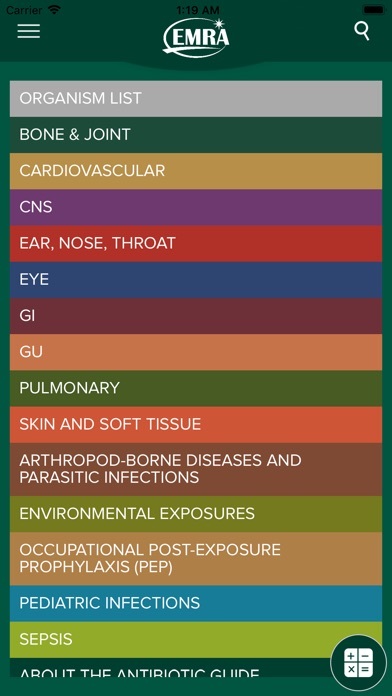 Gone are the “diagnosis”, “organism” and “bookmarks” tabs. Gone are “antibiotic details” and the “Resources” sections. Very infrequent are guides to prescribing in pregnancy. Missing is the antibiogram promised in the foreword written in the app itself as well as cost guidance. Although the overall content remains top notch, much is missing and the user interface feels clunky where prior iterations felt intuitive and matched design to function. I hope the first update addresses these issues and brings back missing content and a more accessible user interface.